Your home page makes an important first impression … and you only have one chance to make it. You have the opportunity to begin a long and fruitful relationship if you set your home page up to meet the needs of the people who land there. Or you can confuse them and turn them off, never to return. I’m betting you’re aiming for the former, not the latter, right? This week on Hit Publish, I’ve invited three Copyblogger experts to share their best advice on building home pages that work. Is Your Home Page a Concierge? Or a Bouncer? Pamela Wilson: Hi, it’s Pamela Wilson. You’re listening to Hit Publish, where I cover simple ways to get better results with your online business. Today’s episode is going to help you roll out the red carpet for your website visitors. We’re talking about home pages today. It’s where you’ll make that all-important first impression. There are certain things that should definitely be on your home page, and there are a few things that you should avoid like the plague. If you’re not sure which is which, don’t worry. You will definitely know by the time we’re through. In today’s episode, you’ll hear what surprising factor should influence the content on your home page. You’ll also discover the crucial question that you should ask to figure out what to put on that home page. And we’ll tell you about the major resource hog that you should definitely avoid and how to give your visitors just enough information to make them want to keep clicking. Are you ready to throw open the doors to your website with a home page that rocks? Hit Publish is brought to you by the Rainmaker Platform, which handles all the technical elements of a good online business, including design, content, traffic, and conversion. To check it out, head over to Rainmaker.FM/Platform and get started building your online business. Pamela Wilson: First up today is Brian Clark. It’s very easy to look around at other website home pages and just create a copycat page that features the same elements that you see, but that’s really not the best approach. You want to be a bit more strategic about it than just copying what someone else has done. Brian Clark has set up dozens of effective home pages in his time, so I wondered if he would share how we can figure out what exactly to feature on our home pages. Brian Clark: Well, of course, that depends — which tends to drive people crazy — but there is a way to determine it. It’s really based on your business objectives and where your business is at — at this time. For example, when I first started Copyblogger in 2006, the home page was a blog. That was, in essence, the whole site. You had content in reverse chronological order on the home page. You had a sidebar that was very much focused on getting people to subscribe by email or, back in those days, RSS. That’s what I was trying to do. I was focused on creating content to build an audience and then later, because I, at that time, had no products and services, I wanted to learn from the audience and figure out what they want, what they need. Then create that thing. If you are a company that already has products and services, you have to do a different analysis. We can look at the evolution of the Copyblogger home page for some guidance there. When we originally shifted away from a blog home page to a static home page that featured products and other key things that we wanted to highlight, it made a fuss in the blogging world, only because I don’t think a lot of bloggers think like business people. When you’re coming at it as a business person, you have priorities. The only thing that I want to warn against is, if you’re just getting started with content marketing and building an audience, you should focus more on content and getting that person to your audience as opposed to immediately pitching products and services. That’s what everyone does. That’s why people tend to hit a website and leave. Even if you have great content, if you’re not really focusing on getting them to raise their hand and follow you by email or some way where they don’t have to remember to come back, there’s a good chance you’re never going to see them again. No matter what stage you’re at — products or services or not — when you’re getting rolling, you really have to focus on building the audience first. Once they’re in your audience, they’re going to get to know what you have to offer as far as products and services. You can make even explicit offers to them if you’re having a promotion or a special, or just want to highlight how you can help. But, again, if you don’t get them onto the list, you’re not going to probably see them again. A good contrast to the way that Copyblogger home page looks now — which has two different options of website services, Rainmaker and Synthesis — we offer a whole bunch of free ebooks, which is our primary list-building strategy. Then we pull through some content from the actual blog page at the bottom of the home page. If you look at my new email newsletter project, which is much like Copyblogger nine years ago, has no business model — it’s all about content and building an audience. It’s just headline, paragraph of text, and an opt-in form. There is one thing I want people to do. That’s to join the audience. Pamela Wilson: That’s Further.net, right, for anyone who’s curious? Pamela Wilson: OK, great. Very interesting to be able to contrast those two approaches and to know that it’s all about the stage your business is at and your priorities at the moment, and making sure your home page reflects those. Brian Clark: Absolutely, but still, when you’re not sure, always focus on content and audience first. If you do that, you’d get the chance to talk about products and services. Pamela Wilson: What do you think about Brian’s recommendation to think about your business objectives, and also to consider where your business is at right now? Brian also recommended that we focus on building our audiences first before we start making them offers right on our home page. Pamela Wilson: Next, we’re going to hear from Sonia Simone. There are a few basic elements that every home page should have no matter what business you’re in. Sonia is always a great person for helping us to meet the needs of our website visitors first. I asked her if she would share with us what are a few crucial elements that every home page should have. Sonia Simone: This is really an interesting question. It’s almost a philosophical question because it is going to depend on your context. For me, the most important thing any home page for any context — business, nonprofit, whatever it might be — it has to let the visitor know that they’re in the right place. The first element is just make sure the design looks good — it doesn’t look dated. It doesn’t look outdated, dodgy, or fly-by-night, anything like that. That’s just a given. It has to make you feel good and please your eye right when you get there, so you feel comfortable. The other thing, normally, you will have some kind of a site name and tagline that will just give people some idea of what they’re there for. If you are in health and fitness, you need to have some language there about what promise you make for your health and fitness. Other than that, there are a lot of ways people go with home pages. We’ve done all different kinds of things at Copyblogger. We’ve done, for a long time — and a lot of times this is a great way to go — we had the blog as the home page. We led with content. First thing you saw when you went to Copyblogger.com — Bam! You were right into some interesting piece of content that was just going to pull you right in and get you reading and get you going. We didn’t switch from that strategy until we had quite a name and quite a lot of readers and a lot of traffic. I’m a big fan of that one myself because content is so useful for just helping know who you are and what you do. Right now, the home page is a little more featured on some of the products we offer because a lot of people don’t necessarily know that Copyblogger Media is a company that makes software and makes education. It gives people an opportunity to find out more about that. For me, at the end of the day, what goes on your home page really depends so much on the context that people are coming to you and what you are there to help them out with. That’s what I would like you to think about. “What is it that people who are coming to me for what I do?” Maybe I’m a chiropractor. Maybe I’m a freelance writer. Maybe I’m a shoe store. The people who are coming to you, what do they need when they get to your site? What is it that they need from you? What do they need first and foremost? Use that and work backwards from there. It’s really about what your audience needs to start to warm up to you and think you’re awesome, and stick around and find out more about you. That’s the key thing that your home page really needs. Pamela Wilson: Brian told us how to plan our home pages, and Sonia talked about what to include, and also recommended that we think about what our audience needs when they get to our home page. Pamela Wilson: Now it’s time for a cautionary tale. That’s why I rang up Brian Gardner to ask him when it comes to designing home pages, what are three things that we should never ever do. Brian Gardner: There are, among many things I suggest not doing on a home page, three that stand out. Staying away from sliders is by far one of the ones I tell people to do the most. Stay away from sliders. Not only do they convert fairly poorly, they’re also a resource hog on your website. Pamela Wilson: Alright, so no sliders. We want to stay away from sliders. They pull the resources of your website and don’t convert. What should we do instead of a slider? Brian Gardner: ‘Hero area’ is the new design terminology for a full-width image that has some opening text and a pretty substantial call to action. Those convert much better, are highly effective, and really are better eye catchers. Pamela Wilson: They don’t pull as many resources, it sounds like, so what’s next? We stay from sliders. What other things should we avoid when it comes to designing our home pages? Brian Gardner: Now, this is something that’s a little bit close to me. As a person who is into minimalist design, I definitely feel strongly about this. The overuse of fonts and colors and sizes throughout the home page is definitely a problem. Far too many websites I’ve come across have a number of different fonts, a number of different colors, and font sizes that are just inconsistent throughout the page. It’s very distracting to me. When I have too much coming at me at once, I’m not quite sure what to focus on. Maybe I’m even getting mixed signals sent to me because of the overuse. Brian Gardner: Yes, that is correct. Pamela Wilson: Then what’s the third thing that we should never do that we need to stay away from? Brian Gardner: I’ve seen this happen a number of times — too much content. Now, as a content marketing company, we like to say that content is a good thing. And it is. On the front page of a website, I have a feeling that people fill space to fill space. That’s very distracting and really doesn’t go towards the goals of many people. Marcus Sheridan of the Sales Lion says, “The purpose of the home page of a website is to get the visitor to page two.” Breaking that down and going back to the too much content, you don’t want your home page to be page two. In other words, you want to give them as much information as they need to keep coming into the website. Pamela Wilson: So don’t hit them over the head with too many things on the home page? Brian Gardner: Yeah. It’s awfully distracting and hard to consume so much information. It’s just much easier to just put home your point and allow access to the things that they can go deeper into. Pamela Wilson: Brian Clark, Sonia Simone, and Brian Gardner all believe that we should tailor our home pages to our audience’s needs. Make sure you’re answering those basic questions with the elements that you choose to put on your home page. I hope that you’re looking at your home page with fresh eyes today. Take a step back from your home page, and ask yourself does every element you’re featuring really pull its own weight? Better yet, see if you can have someone who’s in your target market sit down with your home page, and let you know what questions they have after seeing it. Ask them what’s confusing to them. Use this feedback to improve your home page. Create a welcoming red carpet experience for your website visitors. This is Pamela Wilson. I want to thank you for being a downright stylish Hit Publish subscriber. 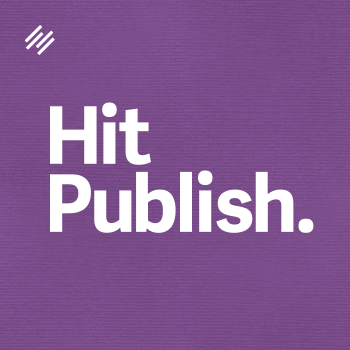 Help others to find Hit Publish. Head over to iTunes, and leave a rating and a review. Bye until next time, and remember to take action and Hit Publish.